Having never made it to any of the Boke Bowl pop-up dinners hosted at various restaurants around town, my first impression when I visited their recently opened brick-and-mortar was that I had just entered an indoor playground. There were children in abundance. Perhaps even more children were present than adults. But who can blame the hapless parents? The guy at the end of my communal table isn’t walking into Biwa for a bowl of ramen with 5 kids in tow. Alternatively, he’s not going to drag them out to 82nd and convince them to gnaw through some beef tendon. He’s going to the place that has effortless counter service, those terrifying pterodactyl trainer chop sticks for them to muddle through their meal with, and homemade twinkies! The kids are welcome, and thus they permeate with abandon. 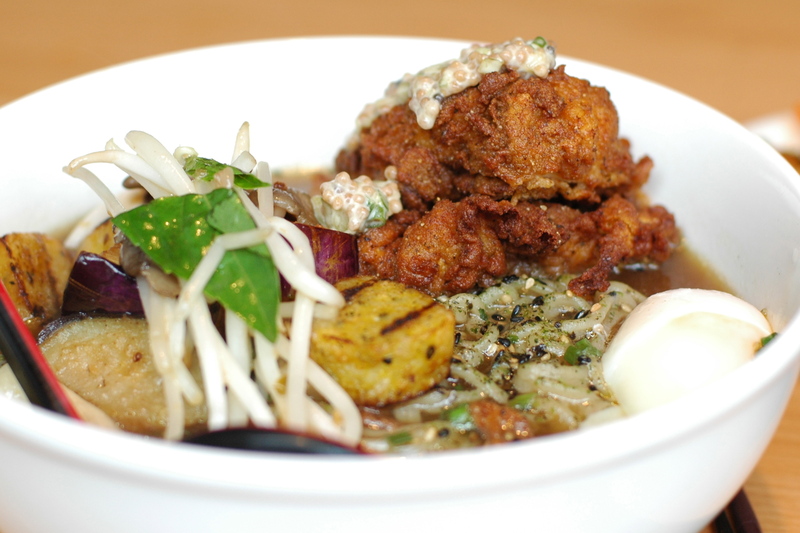 Boke Bowl offers up a safe bowl of soup featuring hand-cut ramen noodles. By safe I don’t mean to say that it’s not delicious, because everything that I’ve eaten here has been pretty damn good. What I mean is that everything is easily recognizable, and there are virtually no surprising elements such as coagulated pork blood you’d find in a bowl of bún bo huê. No bones. Hell, I haven’t even encountered a slice of fish cake. The point is that a bowl of ramen at Boke is a consensus spectrum of elements deemed universally palatable, if not downright delectable. 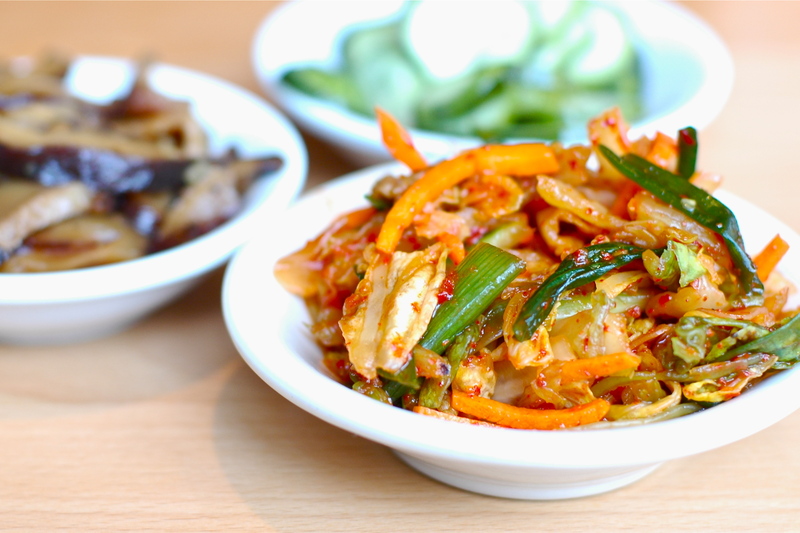 On my last visit I ordered a trio of sides: pickled cucumbers ($1), soy pickled shiitakes($1.5), and kimchi($1). The cukes are a standard quick-salt style pickle, just a bit of salt and sugar tossed in a bowl. They are what they are, a nice nosh, but nothing special. However, the soy pickled shiitakes were a different story. They packed quite a wallop! Like little plastic explosive pickle sponges, they detonated in an intensity of vinegar that knocked me back a bit. I’d read about these in the Momofuku cookbook (there appears to be a lot this restaurant has in common with Momofuku, actually,) but this was the first time I had eaten them. They are a deeply satisfying snack. Unfortunately, the kimchi seemed like an after-thought. Composed of Napa cabbage, julienned carrots, and scallions, it was lackluster with no true bite or pop in the mouth associated with more bold takes on kimchi. Most of the Korean places around town would throw this on the table for free, but Boke charges a buck. It’s a minor quibble. Boke Bowl offers their ramen noodles in a selection of three base broths: pork and chicken, seafood miso, and caramelized fennel. On my first visit, I stuck with the basics, the pork and chicken broth($9), served with slow smoked pork shoulder, greens, bamboo, winter root vegetables , and roasted water chestnuts, standard. I added a slow-poached egg ($1) and pork belly ($1.5) as I am wont to do. For those keeping score at home, that’s an $11.50 bowl of soup, a hefty price to pay for lunch. I can’t front like it wasn’t good, though, because it was. One of the better bowls of soup I’ve eaten around town, actually. The broth was rich and luxurious, especially with the egg worked into it. The pork belly add-on was a substantial slice for the price, crispy yet tender. Despite all of its virtues, though, I still walked away hungry. I’m not a bird. I’m trying to be full for that kind of coin. They could be a little less stingy with the noodles and the broth. Never-the-less, I returned. I went out on a limb and ordered the caramelized fennel broth($8.5). It proved to be worth the risk. While it is a vegan broth, I am decidedly not a vegan, so I added on some buttermilk fried chicken with ODS($3), and the de rigueur slow-poached egg. This bowl was stacked with japanese eggplant, edamame-ginger rice cake (a highlight,) trumpet mushrooms, and bean sprouts in addition to the extras in the last bowl. While I found the pork-chicken broth a sumptuous indulgence, there was something about this caramelized fennel broth that really appealed to my sensibilities. It tasted kind of like a . . . well, a savory cake batter! It had a certain depth that the pork-chicken broth lacked, despite its rich comfort. It didn’t hurt that the fried chicken add-on was tremendous. I had misgivings about throwing a fried piece of meat into a bowl of soup, but miraculously, it worked well. The ODS (orange dot sauce) and the chicken crust that I wasn’t able to devour with due expedience melted into the broth in such a fashion as to enhance the dregs, leaving me no choice but to tilt the bowl and scrape out the last bits of goodness. ~ by Catastrophysicist on January 8, 2012.